Obamacare Cut The Ranks Of The Uninsured By A Third : Shots - Health News The percentage of people without health insurance has dropped to 13.2 percent from 20.2 percent in 2012, according to federal officials. The uptick in coverage has been biggest for Latinos. 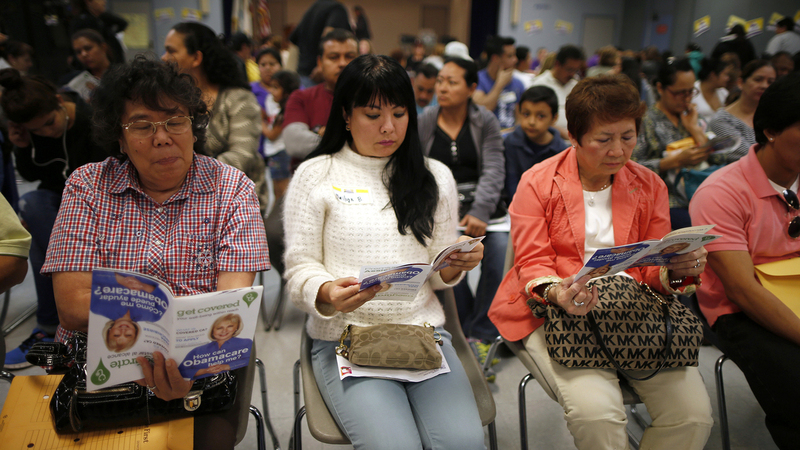 People wait to sign up for health insurance in Cudahy, Calif., in late March 2014. A total of 16.4 million non-elderly adults have gained health insurance coverage since the Affordable Care Act became law five years ago this month. It's a reduction in the ranks of the uninsured the the Department of Health and Human Services called historic. Those gaining insurance since 2010 include 2.3 million young adults aged 18 to 26 who were able to remain on their parents' health insurance plus another 14.1 million adults who obtained coverage through expansions of the Medicaid program, new marketplace coverage and other sources, according to the report from the department released Monday. Officials say the percentage of people without coverage has dropped about a third since 2012: from 20.3 percent to 13.2 percent in the first quarter of 2015. "The Affordable Care Act is working to drive down the number of uninsured and the uninsured rate," Richard Frank, assistant secretary for planning and evaluation at HHS, told reporters. "Nothing since the implementation of Medicare and Medicaid has seen this kind of change." Latinos, who traditionally have been least likely to have health coverage, have seen the largest drop in their uninsured rate, according to the report. The Latino uninsured rate fell 12.3 percentage points, from 41.8 percent to 29.5 percent. The uninsured rate for African Americans fell by nearly half, from 22.4 percent to 13.2 percent. The rate for non-Latino whites fell by just over 5 percentage points. States that expanded the Medicaid program to 138 percent of the poverty line also saw large reductions in their low-income uninsured populations – an average of 13 percent among people with incomes under the new Medicaid threshold. States that haven't expanded the program still saw a decline, though not as large, of about 7 percent. HHS officials said they expect to have better state-by-state breakdowns and estimates of the number of children covered later this year. The ACA turns five on March 23.